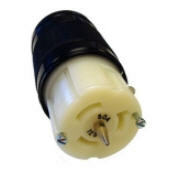 50 amp 125 volt 3-wire female locking connector. Non-NEMA Configuration CS6360. UL Listed. Connects to transfer switch models 500150, R500150, TS500150 and FS500150.